Register Log In AmbergrisCaye.com Home Forums Nature A caterpillar that looks (and acts) like a snake! Some predatory spiders pose as ladybirds and even tree stumps to look as unthreatening as possible. 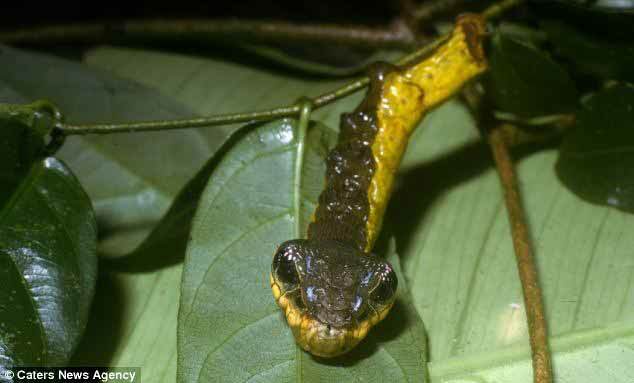 But this caterpillar takes the opposite approach by masquerading as a snake in an attempt to scare away predators. 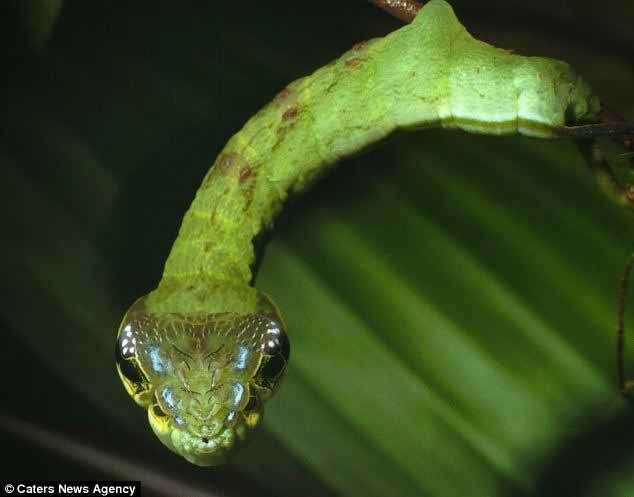 The vivid green 'snake caterpillar' creates the illusion of looking like a dangerous reptile by retracting its legs and expanding the end of its body, which have markings that look like eyes. 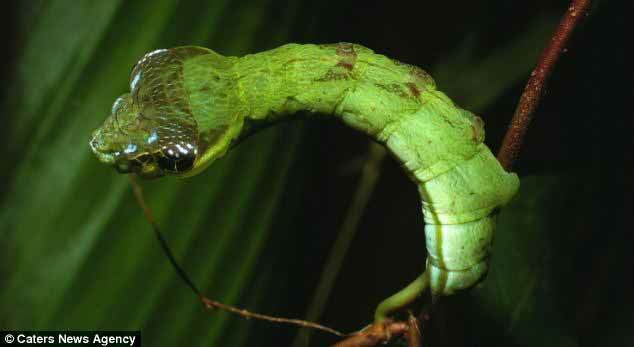 The snake-like caterpillar grows into the moth Hemeroplanes triptolemus. Its chest and wings are covered in scales and the moth feeds on nectar. The sizeable creatures only live for between 10 and 30 days and can be found in Costa Rica, Belize Mexico and Guatemala. 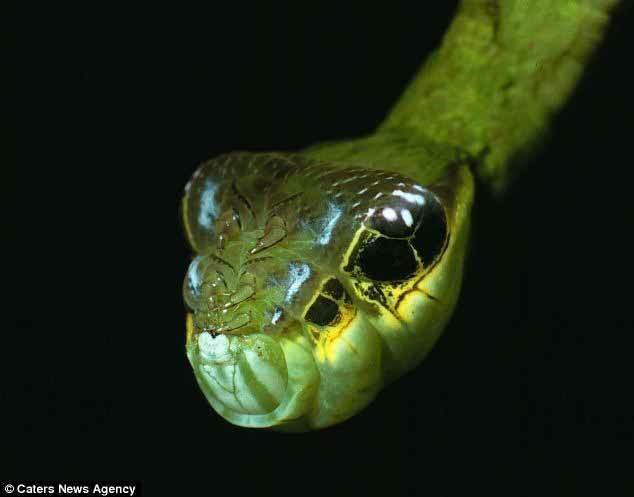 In larval form, the species looks like a snake and even mimics its behaviour as it can harmlessly strike at potential predators. Professor Daniel Janzen captured the images as part of his work cataloguing caterpillars and says it is part of the hemeroplanes species. As well as looking like a snake, the cunning caterpillar even behaves like one. 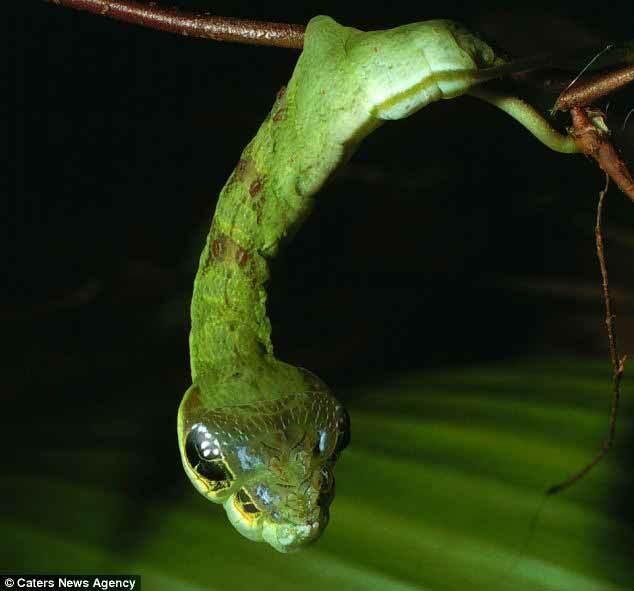 When in a larval state, before transforming into a moth, the creature can strike in defence if it is approached – even though it doesn't have a snake’s capability of administering a bite. Professor Janzen, who is a biologist at the University of Pennsylvania, photographed the insect while working in the Area de Conservacion Guanacaste, Costa Rica. ‘To normal people this caterpillar might look weird and scary, but for me it's just a walk in the park,’ he said. 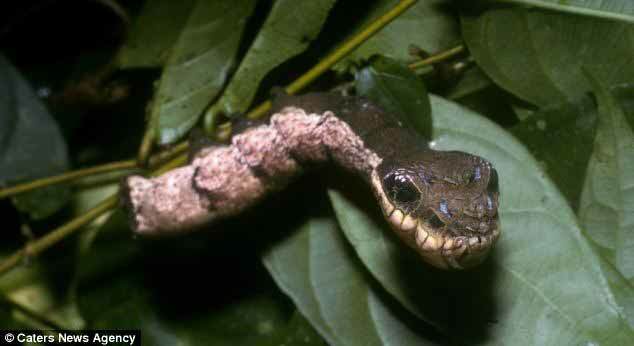 ‘Every caterpillar in Costa Rica looks like something else - be it a leaf, twig or in this case, a slithering snake. Professor Janzen has been tracking Costa Rica's species of caterpillar since 1978 and has been an insect expert for 50 years. He spends half a year at the university and the other half combing habitats in Central America for unusual creatures, such as this caterpillar.